Sacking a manager a few games into the season and assuming a new one will do better is "pie in the sky", says the new chairman of the Scottish Managers and Coaches association. 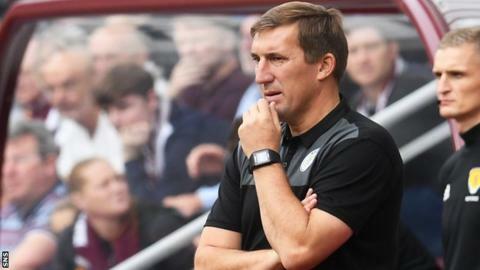 Alan Stubbs' removal as St Mirren boss on Monday, less than three months into his tenure, followed Kenny Miller's seven-week Livingston stint. Championship side Falkirk also parted company with Paul Hartley just three league games into the new campaign. Last season, four Premiership managers were sacked before the end of October. "If clubs keep changing managers frequently, the chances of them being successful are slim," said Billy Brown, who was assistant to Jim Jefferies at four clubs, including Hearts and Kilmarnock. "It is the ones that stick by their manager that tend to give them a good team and success. "When I was with Jim at Hearts, it took us three years to build the team that won the Scottish Cup. You have to be given time to put your ideas into place and get those across to the players." Stubbs recruited 13 players - six on loan - during the summer transfer window as he set about building a side to compete in the top flight after the Buddies' runaway Championship title win last term. But, after an opening win over Dundee, three successive league defeats - and a League Cup exit away to Aberdeen - combined with rumours of dressing-room unrest caused St Mirren to act after "careful consideration". "Alan wanted his own team, but you don't get a chance after three or four games to find out if that team is going to be good enough," Brown told BBC Scotland. "What happens when a new manager comes in if he doesn't fancy those players? He can't get any more now. "If people think a new manager can just come in with the same players, wave a magic wand and they will inevitably do better, that is pie in the sky. "Sometimes people running clubs get carried away thinking they should be doing better and think, if they try someone else, that is what will happen. But it doesn't always work that way." Does sacking a manager in October or November work?